Lori Frederic is a Safety Hero that is looking to reinvent how things are done. Her knowledge of human movement and biomechanics complement the world of safety and health, and it gives her the unique opportunity to share new ideas and bold solutions for injury prevention. One of the greatest things about Lori is how her approach engages all types of workers, on their level, in a fun way. 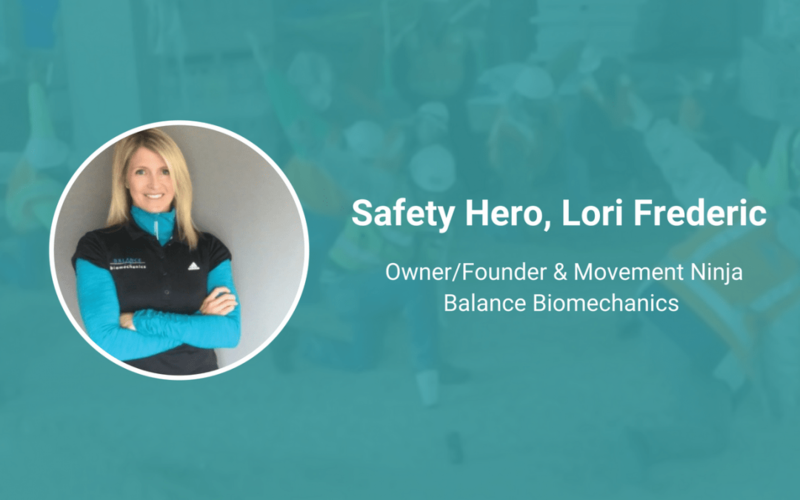 Besides helping workers to become smarter, stronger, more agile, and mobile, Lori also regularly speaks and presents nationally to safety groups, conferences, associations and within companies interested in unorthodox solutions for the safety and well-being of their employees. Let’s take a closer look at her story. I started with individuals, training them for strength, balance and mobility for injury prevention. I really found my passion once I learned how much hard work goes into turning on the lights, modern plumbing and heating a home or business. Bringing relief and pain-free movement to physical workers for all their hard work is truly rewarding. A sense of humor, a bold personality and a desire to truly understand the workers’ environment are essential. When it comes to preventing injuries, YOU are personally responsible for taking action. All the awareness and instruction tips in the world won’t help at all unless you take action and make a change. Getting stubborn, aging field workers to move and stretch by choice and on a regular basis.